Second Life is a privately-owned, partly subscription-based 3-D Virtual world, made publicly available in 2003 by San Francisco-based Linden Lab, founded by former RealNetworks CTO Philip Rosedale. The Second Life "world" resides in a large array of servers that are owned and maintained by Linden Lab, known collectively as "the Grid". The Second Life client program provides its users (referred to as "residents") tools to view and modify the SL world and participate in its economy. The majority of the content in the Second Life world is resident-created. Linden Lab actively promotes the concept that residents retain the intellectual property rights to objects they create. NPR Weekend Edition Saturday: Sci-Fi Inspires Engineers To Build Our Future - Philip Rosedale created the virtual world of "Second Life" based on the "Metaverse" of Neal Stephenson's science fiction novel Snow Crash. from Bantam . . .
"The Metaverse, Stephenson's successor to the Internet, permeates ruling-class activities and constitutes Stephenson's vision of how a virtual reality-based Internet might evolve in the near future. Although there are public-access Metaverse terminals in Reality, using them carries a social stigma among Metaverse denizens, in part because of the low visual quality of their avatars (the Metaverse representation of a user). In the Metaverse, status is a function of two things: access to restricted environments (such as the Black Sun, an exclusive Metaverse club) and technical acumen (often demonstrated by the sophistication of one's avatar)." "The Metaverse,... constitutes Stephenson's vision of how a virtual reality-based Internet might evolve in the near future. 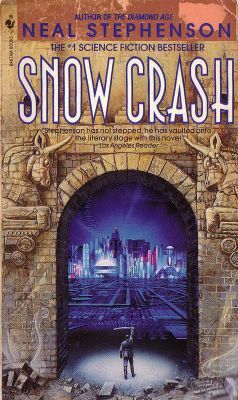 In Snow Crash, the Metaverse can be accessed through public-access terminals in reality. However, using them carries a social stigma among Metaverse denizens, in part because of the low visual quality of the rendered avatar; the Metaverse representations of a user in virtual-reality. Entering the Metaverse through a private terminal, making it possible to customize your avatar, is possible from almost any location using portable devices. In the Metaverse, status is a function of two things: access to restricted environments (such as the Black Sun, an exclusive Metaverse club) and technical acumen (often demonstrated by the sophistication of one's avatar). The Metaverse is frequented mainly by the upper and middle classes. The landscape of Stephenson's Metaverse is a black ball 65536 km (216 km) in circumference, over 1.6 times Earth's equatorial circumference. The Street runs around the equator of the virtual sphere and is 100 meters across. 256 Express Ports are located evenly at 256 km intervals beside the Street. These 256 kilometer intervals are further divided by Local Ports, one kilometer apart. Just like with terrestrial real-estate, you can buy a development license and build anything you want off the street so long it is approved by the Global Multimedia Protocol Group, the group which specifies and runs the Street protocol."